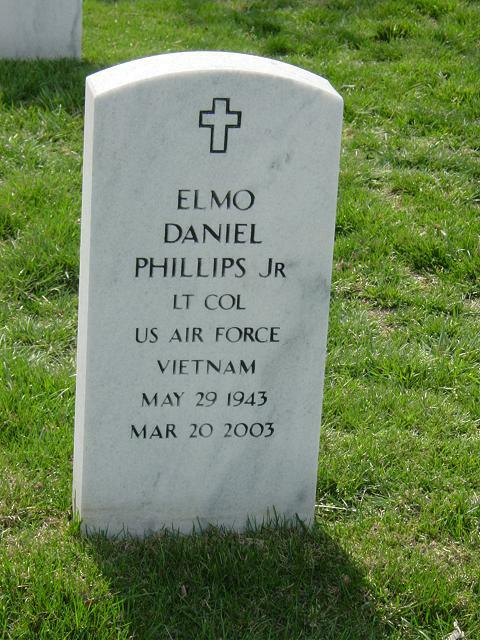 Elmo Daniel Phillips Jr., 59, an Air Force pilot who retired as a Lieutenant Colonel in 1988, died of multiple myeloma March 20, 2003, at home in Springfield, Virginia. Colonel Phillips served 22 years in the Air Force, including tours of duty in Thailand, Alaska and Hampton, Virginia. During the Vietnam War, he flew fighter aircraft over North Vietnam. He was born in Washington and attended Warren County High School in Front Royal, Virginia. He graduated from the Citadel in 1966 and immediately began his Air Force career. He received a master's degree in business administration at Central Michigan University. His military decorations included a Distinguished Flying Cross with two Oak Leaf Clusters, Meritorious Service Medal with two Oak Leaf Clusters, Air Medal with five Silver and three Bronze Oak Leaf Clusters, and an Air Force Commendation Medal. In retirement, Col. Phillips was a senior defense contractor for Anteon Corp. in Crystal City. He was a Civil War enthusiast and historian, and a member of Christ Evangelical Lutheran Church in Fairfax. Survivors include his wife of 33 years, Carolyn Janice Phillips of Springfield; two children, Steven Daniel Phillips of Lorton and Susan Janice Phillips-Smith of San Diego; a sister, Carol P. Solomon of Reston; and three grandchildren. On Thursday, March 20, 2003 at his residence, ELMO D. PHILLIPS, JR. Husband of Carolyn J. Phillips; son of Elmo D. Phillips, Sr. and the late Kathryn Bly Phillips; father of Steven D. (Abby) Phillips and Susan J. (Kevin) Phillips-Smith; brother of Carol (Jack) Solomon; grandfather of Jordan D., Tyler P. and Bailey M. Phillips; uncle of David Solomon. Services will be held on Tuesday, March 25, 2003, 11 a.m. at Christ Lutheran Church, 3810 Meredith Dr, Fairfax, Virginia. Interment Arlington National Cemetery, Tuesday, April 8 at 3 p.m. with Full Military Honors. Memorial contributions may be made to the Multiple Myeloma Research Foundation, 3 Forest St., New Canaan, Connecticut 06840.